Don't Buy Miss Saigon | Sign Our Petition! Elaborate theater props can’t mask the deeply rooted bigotry of Miss Saigon. 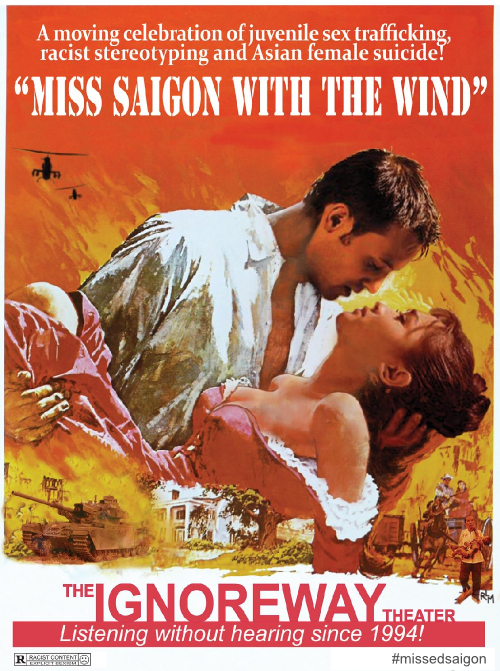 Since its release on Broadway in 1991, this show has gone on to dehumanize Asian people, romanticize sexual trafficking, and trivialize war — all to the tune of millions of dollars made over the course of 4,264 productions. Now, 12 years after closing on Broadway, Miss Saigon is attempting to make a comeback. But not if we have anything to say about it.